To commemorate International Human Rights Day on 10 December 2006, Amnesty International invited various social groups to participate in a street carnival in Causeway Bay ¡V one of the busiest shopping districts in Hong Kong. 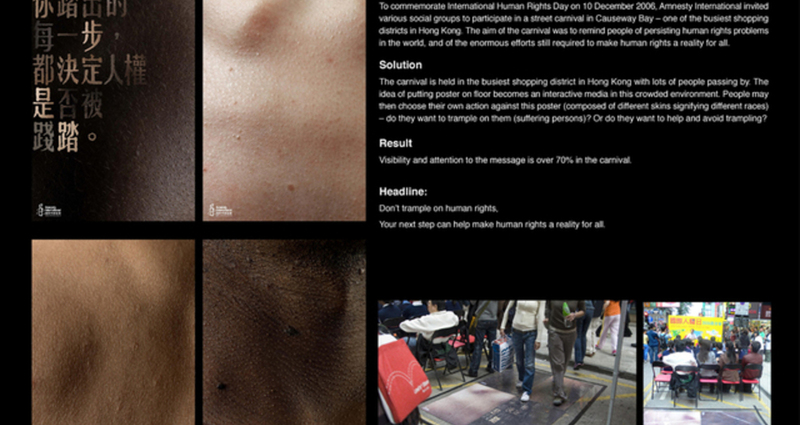 The idea of putting poster on floor becomes an interactive media in this crowded environment. People may then choose their own action against this poster (composed of different skins signifying different races) ¡V do they want to trample on them (suffering persons)? Or do they want to help and avoid trampling? The aim of the carnival was to remind people of persisting human rights problems in the world, and of the enormous efforts still required to make human rights a reality for all. People will notice what they step on, especially on crowded environment. Thus the poster on floor will be seen and people may choose their own action against the poster. The interactivity between the audience and the message is a powerful communication and really make them think before they walk. Art Center College of Design Client: Sushi 2 go Title: Sushi delivery. Hand roll tornado.